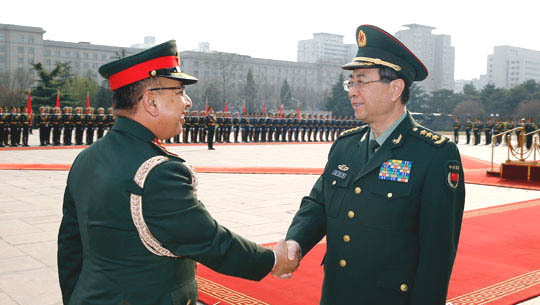 (TibetanReview.net, Apr12, 2016) – As if it is not hard enough already, life for the Tibetans living in Nepal appears set for further restrictions following reports that China’s Chief of Army Staff, Mr Fang Fenghui, had proposed to increase cooperation in clamping down on any type of Free Tibet activities in the country during a meeting with his visiting Nepalese counterpart Mr Rajendra Chettri. Besides, one of the main focuses of cooperation in this area is restricting the illegal flow of Tibetan refugees across the border which has been one of China’s top priorities, reported myrepublica.com Apr 10. He has added that establishing a base-camp in the region would not be possible unless more Armed Police Force personals are deployed in the district. Regarding ‘Free Tibet activities’, Nepal has in the past, acting under pressure from China, clamped down even on celebrations such as those marking the Dalai Lama’s birthday or the Tibetan democracy Day, or the anniversary of the conferment of the Nobel Peace Prize on the Dalai Lama.